#WinterisComing: Along with mountain areas, parts of the Great Lakes are the snowiest places in the U.S.
As the winter months begin, they bring the phenomenon that every Great Lakes resident knows (and either loves or hates): lake effect snow. Lake effect snow happens while the Great Lakes are still unfrozen and relatively warm. Cold air (usually from Canada) sweeps over them, picking up moisture and warmth on the way. It then drops the moisture as snow downwind. This might sound a little confusing — how could “warm” lake water result in snow? Well, the warmth from the lakes is only enough to get the moisture from the surface of the lake into the atmosphere. Once the moisture is up in that mass of cold air, it turns into snow and then falls — usually about the time it’s passing over whatever freeway you use for your afternoon commute. Check out this map of the United States: you’ll notice that things generally get snowier the farther north you go, but that the really dramatic snowfall (average of more than 8 feet annually) occurs in two places: high mountain elevations and land adjacent to the Great Lakes. Many areas in the Great Lakes basin average at least 4 feet annually. You can thank lake effect snow for this. 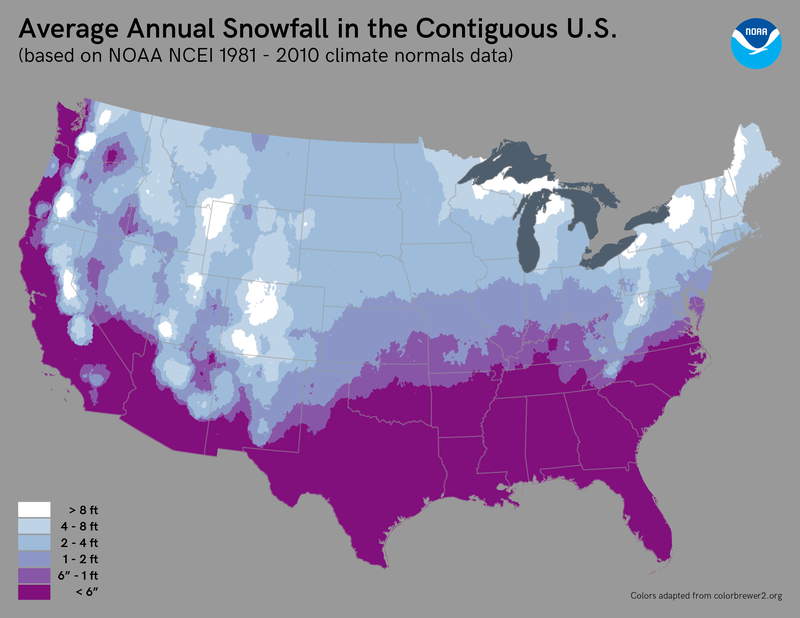 Map showing average annual snowfall in the contiguous United States. Notice that the western shore of Lake Michigan and Southeast Michigan/Northwest Ohio are somewhat spared — wind patterns have a lot to do with this. It is not enough to just be next to a Great Lake — the wind has to be blowing your way. The GIF below shows lake effect snow in action. The black arrows represent wind speed (length) and direction, and the color scale shows snow accumulation. This is model output re-creating a lake effect snow event from December of 2016. Model output for a lake effect snow event back in December of 2016. Arrows show wind speed and direction and color scale shows snow accumulation. Researchers at the NOAA’s Great Lakes Environmental Research Laboratory, along with partners from the Cooperative Institute for Great Lakes Research (CIGLR), are working on a model that can indirectly improve predictions of lake effect snow through the expected latent heat flux from the lakes. “Latent heat flux” is fancy terminology for that warmth, and associated water, moving from the lakes to the air that we talked about earlier. So, if the latent heat flux is predicted to be high (lots of moisture and warmth being transferred from the lake to the atmosphere), there’s a greater chance of a lake effect snow event. You can see that model output here, although for now it’s a “nowcast” — a re-creation of the last 5 days. However, forecast data (and data for more lakes) is on the way!